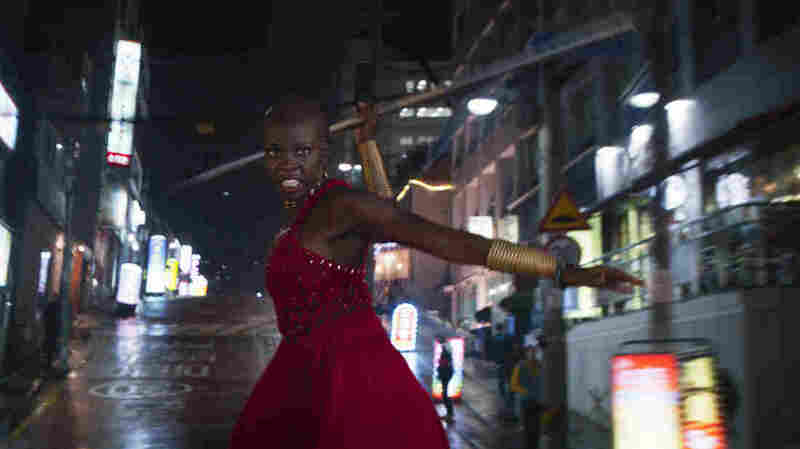 Danai Gurira On Her 'Black Panther' Role: 'She Protects What We Would Have Been' The actress plays warrior Okoye in the new film. "The thing that really connected me ... was her love and her loyalty to this thing called Wakanda, this nation that was never colonized," she says. 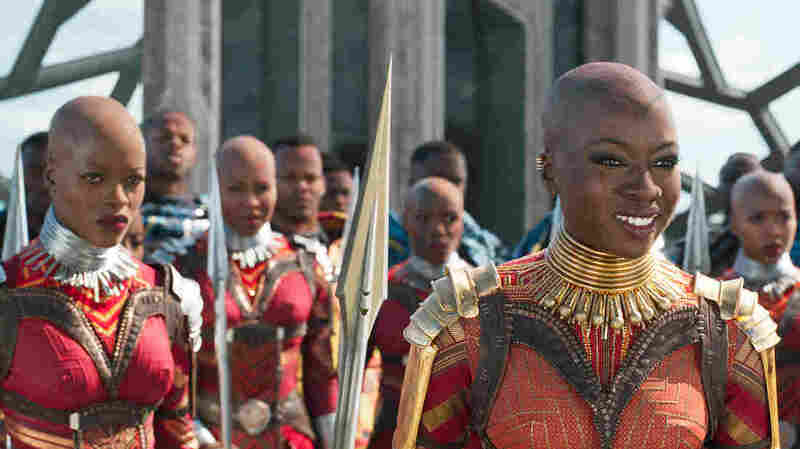 L-R: Florence Kasumba as Ayo and Danai Gurira as Okoye in Black Panther. Black Panther is a film that's not only hot but historic. It's based on the Marvel comic of the same name and is directed by Ryan Coogler (Fruitvale Station, Creed). According to Fandango, pre-sale tickets for the film have already surpassed that of any previous superhero movie ever. Black Panther is the alter ego of King T'Challa, who reigns over the fictional African kingdom of Wakanda, the sole source of a substance called vibranium. It's given the kingdom great wealth and technical advancement, which King T'Challa (played by Chadwick Boseman) is sworn to protect. 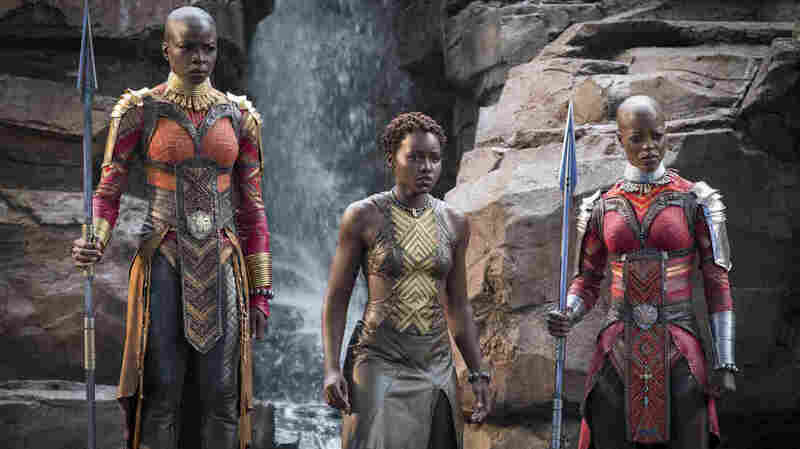 He, in turn, is protected by a group of female warriors led by Okoye, played with scene-stealing verve by actress and playwright Danai Gurira (The Walking Dead, Mother Of George). "When we were announced as the additional cast at Comic-Con, that was really amazing," Gurira says. "But then the real moment hit — it was when that trailer came out. That's when the response was something we could never have imagined, quite honestly." I've always felt blessed to be a part of this because I could understand the response, in the sense that this is imagery and narrative that many of us have yearned for. I know, being a black woman who's from Zimbabwe and from the United States, I've yearned for this type of imagery. I mean, it's one of those things I'm just excited it was getting made. The idea of actually touching into Africans being treated with this sort of respect and on this type of a platform, and the narrative coming from, you know, the black perspective entirely. And the sort of pride. There's something about the pride that this shows, that Wakanda shows — African pride, black pride, pride of your people, of your culture, of you know, who you are outside of any hegemonical influence, and how you can create your own hegemony right there amongst your own people. That, I think, is something people have really attached to. And I get it, being that I'm African, but you know I think it's beyond that. Many, many people of every different race I've come across are really attaching to that, and it's just been really thrilling. I really couldn't have anticipated it. L-R: Okoye (Danai Gurira), Nakia (Lupita Nyong'o) and Ayo (Florence Kasumba) in Marvel's Black Panther. I was like, "What?" I couldn't even believe it. I was like, "Marvel and Ryan Coogler are doing what?" Like, I was trying to piece [it] together in my brain. My manager had to repeat it like four times. But like when I sat down with Mr. Coogler, you know, what's so very important to me as an African woman and as a playwright who writes from the African perspective — because of the lack thereof, or the misrepresentation thereof, or the distortion thereof — it was very important that this was, you know, that an African narrative is treated with the respect and authenticity. And sitting down with him and hearing his vision, I was just like, "OK, this is special." It's great. I mean, I think what's really exciting to me is the idea that it's a blockbuster where I'm speaking Xhosa, you know? I just think that's the coolest thing in the world. Xhosa — it's the same language that is native to Nelson Mandela. It's from the Cape region of South Africa. And Mr. John Kani, who plays T'Challa's father, T'Chaka, he's Xhosa. And so they started and agreed to that language being the language of Wakanda in Captain America: Civil War, where of course, T'Chaka is unfortunately killed. Danai Gurira as Okoye in Black Panther. Okoye is the general of [T'Challa's] armed forces — she's the head of the Dora Milaje. The Dora Milaje, as we know from the comic books, are like his special guard. They're also pretty much the guardians of the throne and the royal family, which makes them pretty much the guardians of the stability of the nation. And she works pretty much as his right hand woman — not man — and is involved in everything he does. I thought that was just such a combination that you don't often get to see. One gets sacrificed for the other in some sense, but it's — I know so many fierce and feminine women, you know? And I was like, "When do we get to see that on screen?" And so the thing that really connected me in a really powerful way was her love and her loyalty to this thing called Wakanda, this nation that was never colonized and consequently became the most advanced nation on the globe, in terms of technology, and used its resources for its own people, which Africa never got to do. The idea of being a guardian of that place, of being a protector alongside the king and protecting him, alongside Black Panther. To me, that just resonated so deeply as something that, you know, you are loyal to — to the death and beyond. You are upholding the traditions and the brilliant ideals of your foremothers and your forefathers and you do that at all costs. And she's a traditionalist. I'm not a traditionalist, but in a sense I am because I always wonder — Africans always wonder — "Who would we have been if we weren't colonized?" And she protects what we would have been, and to me, it made her very palpable. Dustin DeSoto, Adhiti Bandlamudi and Gemma Watters produced and edited this interview for broadcast. Sydnee Monday adapted it for the Web.